Extract from Robert Wedderburn?s ?The Horrors of Slavery.? Wedderburn was born in Jamaica in 1762 and was the illegitimate son of James Wedderburn, a wealthy Scottish plantation owner, and Rosanna, an enslaved woman who worked on the estate. In this extract he describes his feelings for his mother, who remained enslaved throughout her life. 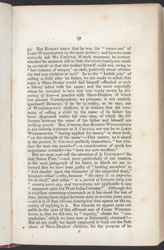 He also describes the correspondence published in the Times in 1824 between himself and James Wedderburn?s legitimate son, who disputed Robert?s claim to the family name.